On the back of the GripStand 3 there is a pivoting, circular handle that can be used in multiple ways. First, it’s an adjustable prop so the iPad can conveniently be viewed in landscape or portrait modes. It also becomes a carrying handle or a comfortable way to hold the iPad while standing—or even when lying down. 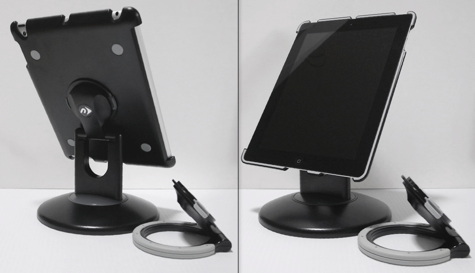 The round portion of the handle is a soft, grippy rubber that is comfortable to hold and adds a non-skid feature to your iPad when it is propped on a table. The handle is easily removable for travel with a pinch of two clasps. NewerTech thoughtfully added rubber pads to the back of the unit so that when the handle is off, it rests securely on these non-skid pads. With the handle removed, the iPad in its GripStand still will fit most existing cases and sleeves. The smooth notches around sides of the case for the switches and plugs are sleekly sculpted to provide access to the controls. Along the left side, Apple’s Smart Cover still clicks onto its magnets perfectly. But, wait, there’s more—NewerTech has developed a base that fits the GripStand 3 called the GripBase. 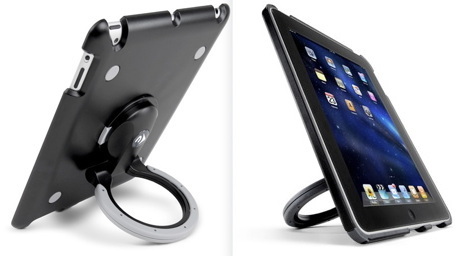 The handle on the back of the GripStand 3 and GripBase utilize the same fitting so that either can be attached to the iPad. Very clever. NewerTech really thought this device out carefully and it shows in its overall build quality. The case adds some thickness to the iPad’s slim profile, but it adds many additional conveniences that all perform well. The bundle including the GripStand 3 and the GripBase is priced very well at $39.99; in fact, it’s a good deal. Other cases with handles on the back are either cheesy or, if well-built, are quite expensive when compared to this very useful bundle. If you haven’t experienced the convenience and comfort of a handle on the back of your iPad, you really should try it out; the GripStand 3 / GripBase bundle is an excellent introduction.